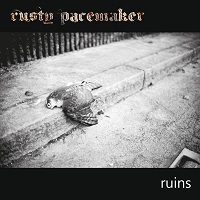 “Ruins” is RUSTY PACEMAKER’s second full-length album, written while his first album “In Blackness and Light” was still being promoted in 2011. The sole mastermind behind this project is Austria native, Rusty Hessel. Rusty first started writing back in 2003 and since then has released a few rough demos before releasing the aforementioned album. “Ruins” finally saw a release in May 2015. From the offset of this album the title song “Ruins” shows a lot of potential with the eerie clean guitar intro. The vocals kick in after a minute or so, and at first impression reminded me of early Gothic Rock. This song really sets the tone of the album: dark and depressive with deep lyrics. Although I felt rushed, like this whole song could have been two separate songs. There was a lack of transition in places which severely let it down. The next song “Made of Lies” offers a welcome change from its predecessor. We’re given the chance to almost feel happy again with an upbeat guitar riff and solid drum beat. The ominous vocal style of Rusty fits the music style a lot more in this song than in the previous. “Night Angel” breathes a breath of fresh air back into the album with the welcome appearance of Lady K. Her voice is hauntingly beautiful and compliments the track. Her vocal style, while it is opposite to Rusty’s vocals, when used together they complement one another. It does make one wonder why her vocals were not utilised for more of the album. “Candlemass” is also another great, redeeming factor of the album. The vocals weren’t overwhelming; they felt like another instrument that worked extremely well and fitted right in. The intro has a sinister and ritualistic feel to it. Rusty’s influence of BATHORY and Quorthon is hugely evident in this song. On the whole “Ruins” is full of potential. You are really taken on a dark and atmospheric musical journey. Instrumentally, this is a solid album which shows the talent of Rusty as a musician. However, there is one fatal flaw of this album: the vocals. While in some songs the vocals are fitting, the majority of this album lacks vocal diversity. Throughout the album there is the same dull and lifeless vocal presence. This sometimes makes it hard to appreciate the musical talent featured on this album. Rusty does, however, show in “The Game” and “Candlemass” that he has the ability of a wider vocal range but chooses not to use it. Like wandering machine gun fire, this album does hit its target, but more often than not, does not deliver the fatal blow.